Giftventure is unlike anything I've ever seen before. It's both a product AND a service– as described on its website, it is a "personalized treasure hunt that comes in the mail." When you register for their service, your child will receive three separate pieces of mail – two letters and a treasure map – that direct him or her to a gift that you've hidden. We were asked (by Mom Central) to review Giftventure recently and, happily for us, its arrival coincided with Roo's 4th birthday. Signing up for a Giftventure is very quick. On their website, just select which character your child would like to receive the map and letters from and which adventure you'd like them to experience. The characters include a pirate, a fairy princess, a dragon, a unicorn, Santa Claus, Cupid and the Easter Bunny. Giftventure themes range from specific holidays to just for fun. You must also specify where you are hiding the gift. Giftventure does not supply gifts, just the search for them. I chose Sophie the Unicorn and the Treasure Map Adventure, then hid a lunchbox filled with a couple of DVDs under Jasper's crib, where I didn't think Roo would be likely to come across them. I received a package containing all three items together, so I could distribute them to Roo on our own schedule, but you can also have them sent individually, direct to your child. 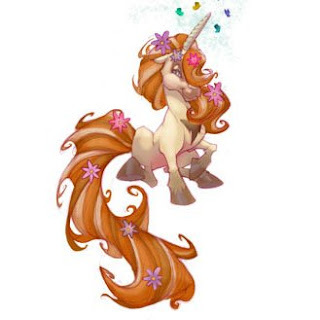 At 4, Roo didn't notice the erratic times her Unicorn missives came, but I think an older child would be more skeptical. She loved getting mail that was addressed to her, especially since she is learning to recognize her written name. 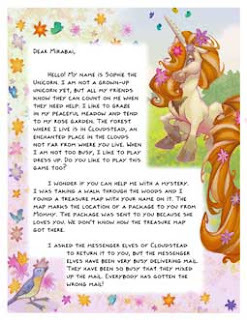 The first letter was an introduction, with a simple matching game on the second page that we were supposed to complete and then post in a window so "messenger elves" would be able to see it and send her a treasure map. 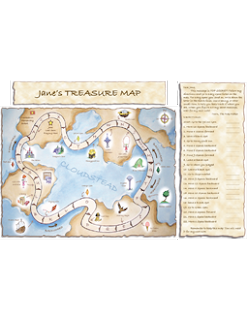 The treasure map uses a simple code (letters attributed to spaces on the map) to reveal a hidden message letting your child know there is a present waiting to be discovered! The third letter also uses the treasure map from the second mailing. Your child must use it to decode the location of his or her present. Roo loved the look of the treasure map and, especially, the concept of messenger elves and unicorns working to find presents for her. She had fun working on her Giftventure but might have enjoyed it more if she could do more of it herself instead of basically watching mommy and daddy go through all the steps. It would be a perfect for an older child, especially one who reads or is just learning to read. For Easter, Giftventure is offering 10% off the regular $19.95 list price! Enter code momcentral at checkout! Sign up by March 14 and get reduced shipping , too! Great idea! And my sons are NUTS about pirates! Very very cool! What a neat idea, I wish I came up with it.